Divisions: India is divided up into 29 states and 7 union territories. 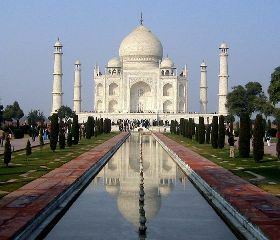 The largest of the Indian states by population are Uttar Pradesh, Maharashtra, and Bihar. As of 2011 Uttar Pradesh had a population of around 200 million. The largest states by area are Rajasthan, Madhya Pradesh, and Maharashtra. The capital city of Delhi is considered a union territory. Description of flag: The Indian flag, called the Tricolour, was adopted on July 22, 1947. It consists of three horizontal stripes of saffron (top), white (middle), and green (bottom). At the center is a navy blue wheel with 24 spokes called the Ashoka Chakra. The color saffron represents courage and sacrifice, the color white stands for truth and purity, and the color green represents prosperity. Other Holidays: There are a number of holidays celebrated in India. Which holidays are celebrated depends on the religion and area where a person lives. The three national holidays are Republic Day (January 26), Independence Day (August 15), and Mahatma Gandhi's Birthday (October 2). Other popular holidays and celebrations include Raksha Bandhan, Navratri, Diwali, Eid ul-Fitr, Eid al-Adha, Easter, and Christmas (December 25). Origin of the name India: The name "India" comes from the Persian word "Indus" for Hindus. 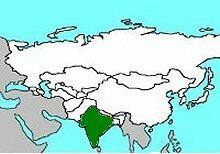 The people of India generally refer to their country as Bharat or Hindustan. Bharat is an official name called out in the Indian Constitution.